Kuromoji is an open source Japanese morphological analyzer written in Java. Kuromoji has been donated to the Apache Software Foundation and provides the Japanese language support in Apache Lucene and Apache Solr 3.6 and 4.0 releases, but it can also be used separately. Download Apache Lucene or Apache Solr if you want to use Kuromoji with Lucene or Solr. See below for some usage details. Download from GitHub if you would like to use Kuromoji for standalone applications. We are a small R&D and consulting company based in Tokyo. We are proficient in the fields of search, natural language processing, big data and more. Please see our homepage for more info. Basic morphological analysis Word segmentation, part-of-speech tagging, readings, lemmas, etc. Try Kuromoji from the command line using the below commands, and then write some text followed by RET. Info You may need to add option -Dfile.encoding=UTF-8 to get a suitable output in your terminal, depending on your system. For search applications, it's often useful to do additional splitting of words to make sure you get hits when searching compounds nouns. For example, we want a search for 空港 (airport) to match 関西国際空港 (Kansai International Airport), but most analyzers don't allow this since 関西国際空港 tend to become one token. This problems is also applicable to a katakana compounds such as シニアソフトウェアエンジニア. The below table gives some examples of these modes. Kuromoji provides the Japanese language support in the upcoming Apache Lucene and Apache Solr search products (3.6 and 4.0). Additional to the above, there are lots of useful token attributes with readings, romanized readings, part-of-speech, etc. The above is available in Lucene as JapaneseAnalyzer and a default field "text_ja" in Solr's example schema.xml. Configuration options are of course also available. Tip To search Japanese using Solr, simply use field type "text_ja". 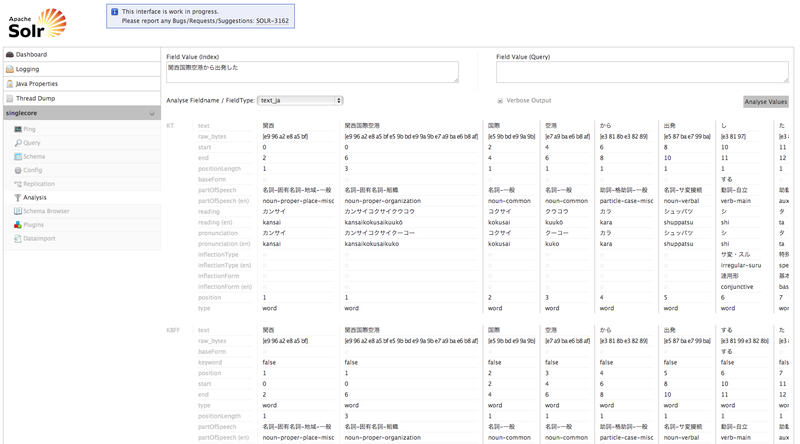 Tip To search Japanese using Lucene, all the above is available using JapaneseAnalyzer. In search mode, we want to split compounds in order to make their parts searchable, which is good for recall. In order to make sure we maintain precision for an exact term match, we also keep the compound in our index as a synonym to get a rank boost (typically from IDF). Kuromoji makes recall and precision considerations for overall good ranking. Tokens for 関西国際空港. We keep the compound as a synonym in position 1. 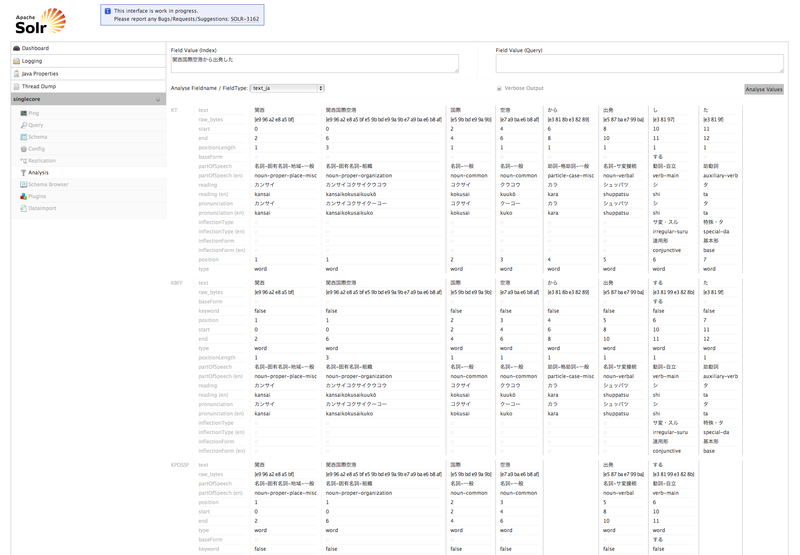 Below is an analysis screenshot of Solr 4.0 for the text 関西国際空港から出発した (I departed from Kansai International Airport). Info Several token attributes available, including part-of-speech tags, readings, romanized readings, etc. Programming example Word segmentation, part-of-speech tagging, readings, lemmas, etc. Kuromoji is packaged as a single jar file, is Mavenized (see below), and doesn't have 3rd party dependencies to make it easy to work with. Below is a simple Java example that demonstrates how a simple text can be segmented. Tip Kuromoji is thread-safe so you can tokenize text from multiple threads. To use Kuromoji with Maven, first add the repository to the <repositories> section of your pom.xml as indicated below. You should now be able to use Kuromoji in your project. Various additional information about Kuromoji is provided below. Kuromoji is licensed under the Apache License v2.0 and uses the MeCab-IPADIC dictionary/statistical model. See NOTICE.txt for license details. Kuromoji supports the MeCab-IPADIC dictionary and has experimental support for UniDic. Contact us if you need additional dictionary support. Apache Lucene and Apache Solr and their respective logos are trademarks of The Apache Software Foundation. © Copyright 2011-2014 Atilika Inc.